—Another Caracciolo. I should have guessed that the Roman Catholic patron saint of cooks would also be one of the saints of Naples! He is St. Francis Caracciolo (1563-1608). He was born in the Abruzzi region of Italy, but studied theology in Naples starting in 1585 and became a priest there. There is an exhibit about his life currently running at the ancient Baslica of Santa Maria Maggiore, where in 1593 he opened the first house of the Congregation of the Minor Clerks Regular, which he helped to found. Caracciolo was beatified in 1769 and canonized in 1807. His feast day is June 4. 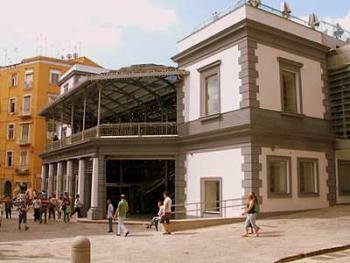 His remains are in the church of Monteverginella in the historic center of Naples. Interestingly, he is not generally known today in Naples. —After a year and a half of construction, the bottom station of the Montesanto cable-car is finished. As well, the station is the downtown Naples terminus of the narrow-gauge Cumana railway. For months, it looked like a pit. Now they have put in place a neat little retro-style 1890-ish station (photo, right). I am well pleased. —Old statues in Naples and elsewhere look better from a distance than they do up close. Indeed, as you approach the row of famous eight statues on the western facade of the Royal palace, you start to see that bits and pieces have been chipped or broken. Entire fingers are missing, swords are broken off, etc. Some of that can be chalked up to the ravages of time and some of it is no doubt due to vandalism. A commission has been set up to use public subscription to pay for the restoration of the statues, currently underway. —Over the last few years, almost 600 horses have been rescued from the clutches of what is called the "zoomafia." The animals are used in illegal trotting races on steets in one of the roughest parts of town, Poggioreale, home of the brand-new Civic Center as well as the largest prison in southern Italy. A short while ago, passengers were trapped in their bus for an hour while races were held on their street—jockeys, racing gigs, the whole deal, all patrolled by zoo-mobsters on motorcycles who made sure no one interfered. As they say, investigations are on-going. Arrests will no doubt be made, a few more horses salvaged, and drugs used to juice up the poor creatures will be confiscated. —I went to a funeral the other day and learned that the deceased had ordered the cremation of his remains. That no longer raises eyebrows in Naples, although it used to. Indeed, Christians have generally buried their dead over the centuries, viewing cremation as pagan. There is nothing really doctrinal about this at all. Christian writers as long ago as the third century said that the mode of burial obviously could not interfere with the resurrection of the body by an omnipotent God. Nevertheless, in Italy, and especially in the south, families still retain a psychological attachment to their departed loved ones if they can go "visit" them in a cemetery. In any event, the deceased in the first sentence had to be transported to Salerno because there is no facility for cremation in Naples. That is about to change as the go-ahead has been given for just such a facility to open in Naples in 2009.